Available online in white only. For custom colors and custom designs please call 1-800-643-1988. The largest holds your haul: The 525 quart Coffin Box is 6 foot 4 inches in length, 37 inches wide (tapers to 25"), and 21 inches high, the next size coffin/storage box holds 340 quarts of your favorite fish (ideal for 25' and larger boats). We offer a smaller size, at 45 inches long that has a 260-quart capacity. 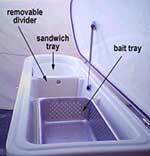 Plus, the insulated box can keep that fish on ice for more than two weeks. Divide and conquer: Most coffin box's comes standard with features such as a removable divider, a sandwich tray, and a perforated bait tray to keep your items separated and organized. Easy access, but not in the way: The box's tapered design allows easy maneuverability for active fishermen. 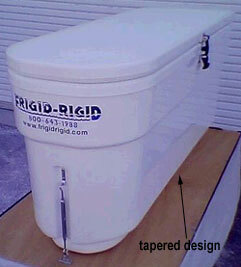 Plus, the box is secured to the deck with our stainless steel turn buckle tie down system, or it can be through-bolted to your boat's deck so that it stays put in rough seas. Quality construction: Frigid Rigid's quality construction beats the competition hands down. Here's the proof. 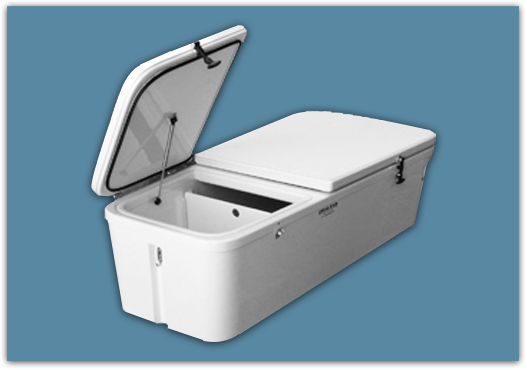 The coffin/storage box's fiberglass construction, two inches of insulating foam, and "D" ring air-tight seal keep your haul cold and fresh in excess of two weeks. More than $555 worth of accessories included: In addition to features mentioned above, the coffin box also includes a reinforced, non-skid lid and a recessed drain. There is also an optional cushion available for the larger size box to expand your seating surfaces. For more information about these features, see our accessories page.